For some time now I have been observing bearish “cracks” appearing in the stock markets, and I have become that irritating analyst who keeps on pointing out the negative. But the speed of the drop in August took me by surprise. I was expecting the symmetry that I discussed in this post to break down on the bearish side, but not quite so fast! The speed of that drop makes it seem likely that the 40-week cycle trough did not form in early July as I assumed at the time, but that it occurred at the end of August, or perhaps is yet to form (because the bounce has so far been a miserable affair, and that trough doesn’t look very certain). I say that it “seems likely” because in fact it is still possible that the 40-week cycle trough DID occur in early July. That possibility has very bearish implications and I will get back to it later, (it is only a possibility and it would be better to discuss the more likely scenario first). Now that we have such a deep trough to work with (and bear in mind that it might not have actually formed yet), we should question whether this is a trough of 40-week magnitude. 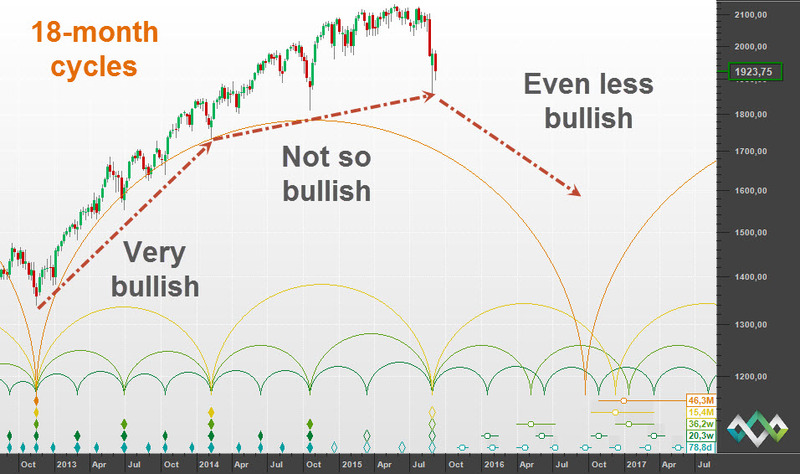 And can it shed light onto the difficult straight-line bull periods that have recently been making our analysis more complicated? This analysis makes perfect sense, but just in case you think that identifying this trough as an 18-month cycle is good news (surely we should get a good bounce out of an 18-month cycle trough? 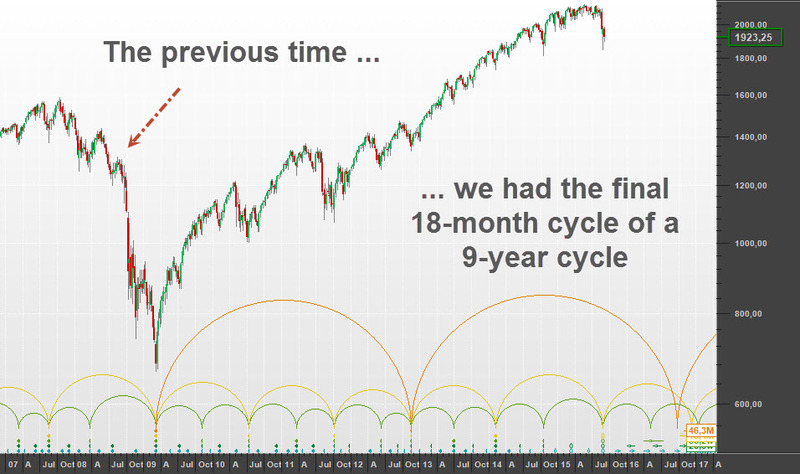 ), I have indicated on the chart the previous time that we lived through the final 18-month cycle of a 9-year cycle. Of course if the March 2009 trough was also a trough of the 18-year cycle then we are in for less of decline, but that will have to be a discussion for another post. We see here the expected sequence of a bullish 18-month cycle, followed by a less bullish 18-month cycle … and next is an even less bullish cycle (which is nice way of saying a bearish cycle). 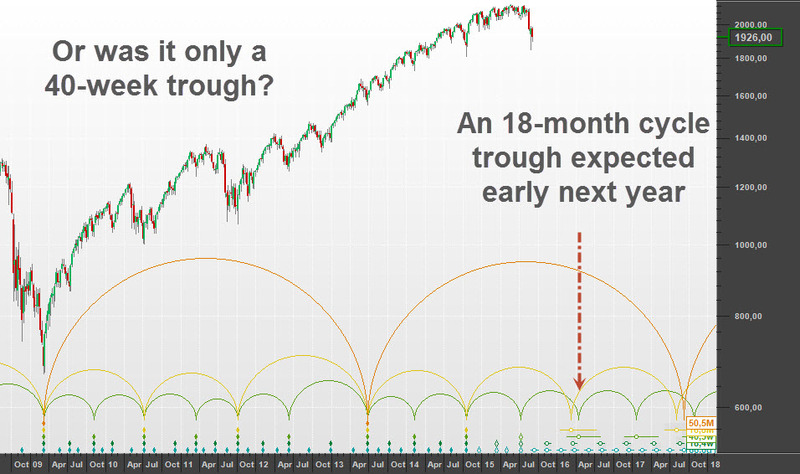 And so we are expecting a bearish 18-month cycle into early 2017. The 18-month cycle trough isn’t such good news after all. What if it is a 40-week cycle trough? But I mentioned above that it is “natural to assume” that because a trough is deeper, it is of greater magnitude. It might be natural, but it is not actually true. The depth of a trough is not determined only by the magnitude of the trough, but also by the combined pressure of all longer cycles. And so it is quite possible that the current trough is only a 40-week cycle trough, made deeper because of an increased bearish underlying trend. As is so often the case with a Hurst Cycles analysis the difference is fairly subtle. If this is the correct analysis then we are still looking ahead to a period of bearish moves, but the rhythm will be slightly different. In particular we should see the formation of the 18-month cycle trough early next year … but that won’t be a particularly celebratory moment, for the reasons discussed above. The analysis looks very reasonable, and is the analysis I was working with before I took a break over August. 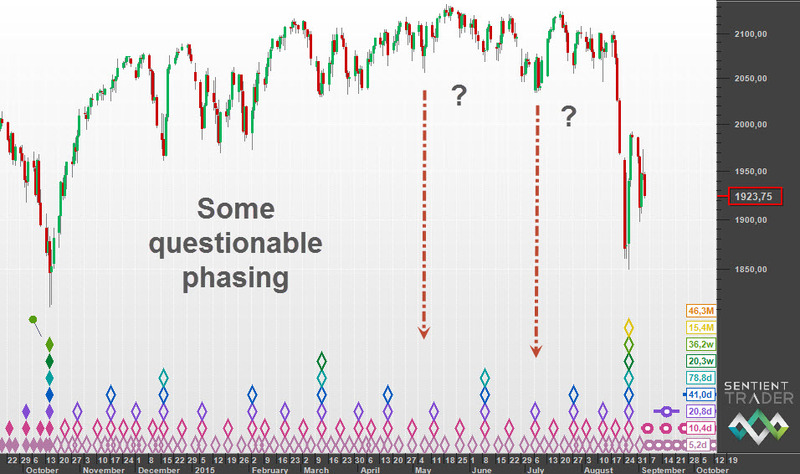 There are many things to like about the analysis – the troughs are all well placed (troughs in the phasing are good clear troughs in price), and the 40-week cycle came in 10 days early, as opposed to 41 days late. But the markets are not perfect, and sometimes the better analysis is not the most pleasing one. Why do I describe the possibility that the 40-week cycle trough did occur in July as “devastating”? Because if that is the correct analysis then the very bearish cycle shape that we have seen since July (an 80-day cycle which is still playing out) is getting its bearish momentum from the underlying trend composed of cycles 9-years and longer. Those are the cycles that have given us such a great bull run. This scenario (if it is correct) indicates clearly that they have turned bearish, and we are likely to see bearish markets for many years. David, take a look at USDJPY for some clues on the phasing. I am trading with your ‘worst possible’ scenario above at the moment as it makes the most cyclic sense. Some may think its the ‘best scenario’! In addition, the NASDAQ made new highs from the proposed 40 week cycle trough in your ‘worst scenario’ case. Using commonality this reinforces the situation of the 40 week occuring Aug 12th. That the 40 week is now straddled is pretty bearish but there will be countertrend rallies I would imagine. *correction: 40 week occuring on July 9th! Thanks David. Those are great observations. I guess many traders enjoy bear markets, but interestingly my “bullish” posts are read and shared more than the “bearish” ones! While the spectral approach paints a slightly different picture, it agrees with the analysis that the index is falling into a 40 week low. It will take a while before it can be confirmed. The spectral pattern of the August high was virtually identical to the four prior 4 year highs! There was a very rare alignment of price waves in August. The sum of the waves 80 weeks and longer was down and every wave from the 40 week down to the 6 minute wave turned down. As I had noted in my prior post, the most recent lower 40 day high was the final indication that the index was about to take a bungee jump. Theoretically, the subsequent price wave sequences will be similar to prior declines, assuming this is one. I’ll be watching and trading it very carefully. 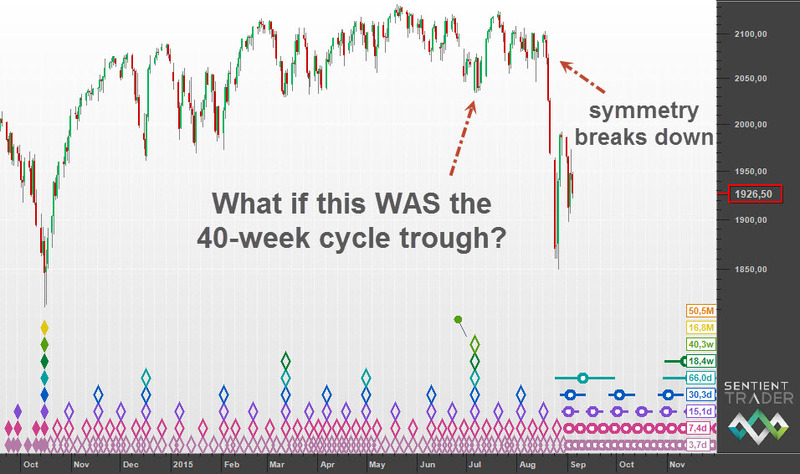 So the 40 week cycle arrived in June or July (nominal cycle period most likely), and it has failed. This is what we have been looking for some time. Still say Oct. 2014 was an 18 month low and now we head into an 18 month low due Jan. 2016. This coming low will be a nested 40 wk, 80 wk, 4.5 year and 9 year low. Actual cycles are running much shorter than Hurst’s nominal cycle periods. I suggested that the second half of 2015 would be rough and now we see. GLGT.